"Beautiful scenes throughout the year are what you should remember (一年好景君須記)" and "Wait not till blossoms are gone to pick the branches (莫待無花空折枝)" are famous lines that both give an idea of how the ancient Chinese appreciated, loved, and cherished flowers. Blooming throughout the seasons, flowers adorn each period of the year with a different atmosphere. These include, for example, the tender beauty and dazzling colors of spring, the lush and flourishing greenery of summer, the pure and serene feeling of autumn, and the cool and lofty purity of winter. There are flowers that represent specific times of the year, blossoming in accord with the seasons and from which the beautiful tale of the "flower spirits of the twelve months" derives. Flowers are messengers for both change in the seasons and also for the festivals and activities in traditional folk customs associated with them, such as the Lunar New Year and Duanwu (Dragon Boat) Festivals. Yun Shouping, a native of Wujin (武進) in Jiangsu, was a master of flower painting in the Qing dynasty. In poetry, he was leader of the Six Gentlemen of Piling (毘陵六逸), and in painting he was renowned and grouped with the Four Wangs of the Early Qing and Wu Li (1632-1718). Yun Shouping combined techniques of the ancients with an approach to "sketching from life." In this work from his "Album of Imitating Antiquity (惲壽平摹古冊)," Yun indicated in own inscriptions on the leaves that he was imitating paintings by Song dynasty artists. This particular leaf was inspired by the appearance of pink peach blossoms and green willow leaves on a spring day. Covered with mineral pigments for lead white to complement the rouge, this work imitates the radiant beauty of a flowering peach tree in brilliant bloom. The willow leaves in contrast were done with translucent plant-based pigments of light yellowish-green to serve as a foil, expressing the tender grace of new sprouts in spring. Although Wei Sheng's dates are unknown, Xia Wenyan (夏文彥) of the Yuan dynasty (1279-1368) in his Precious Mirror of Painting (圖繪寶鑒, chapter 4) has a short entry that states, "Wei Sheng: Extremely gifted at flower-and-bird painting (衛昇，畫花鳥甚佳)." It appears in his discussion of Southern Song (1127-1279) painters, suggesting that Wei was also an artist of that period. This work comes from "Album of Collected Song and Yuan Paintings (宋元集繪冊)." It shows an elegant branch of crape myrtle with blossoms of vivid color. This tree flowers in summer and its blossoms last for several months, hence its alternate name in Chinese as "Hundred-days red (百日紅)." It is an important flowering tree for appreciation in summer and autumn. In this work, a branch of crape myrtle extends into the composition from the lower left, the red blossoms and green leaves thriving with life. The centers of the blossoms appear like dense strands of silk forming tassels, the petals folded into delicate crinkles. Also, the full buds are oval-shaped, thus successfully capturing the unique features of the crape myrtle. Xu Wei (style name Wenchang 文長; sobriquet Tianchi 天池; late sobriquet Qingteng Laoren 青藤老人) was a native of Shanying (山陰, modern Shaoxing 紹興, Zhejiang). Inquisitive by nature, he excelled at paleography and diction, with his running cursive script calligraphy being most marvelous and painting in a style of his own. Xu Wei in his middle years began studying flower painting, his brushwork being naturally unrestrained and full of brilliant charm. 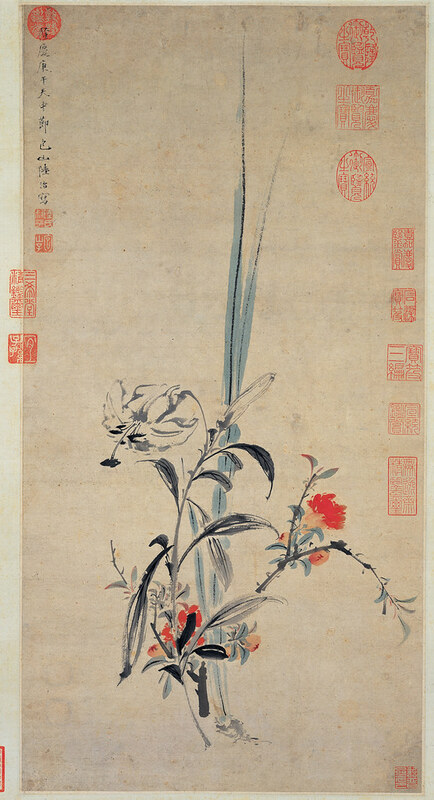 This painting depicts peony and bamboo stalks in monochrome ink using the "sketching ideas (寫意)" manner, presented them in a heroic and swift manner. 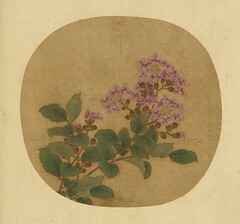 The area of the flower petals clearly reveals light ink saturated with water, the brush then having been dipped in dark ink to complete the painting. It creates an intentional effect of ink halo gradations. The stalks and leaves of the bamboo were rendered with cursive-style calligraphic lines, the brushwork throughout being strong and swift, making this a work of great directness and energetic ease. Yun Shouping (惲壽平, 1633-1690), a native of Wujin (武進, modern Changzhou 常州) in Jiangsu, studied the "boneless (沒骨)" style of wash painting practiced by the Northern Song master Xu Chongsi (徐崇嗣, fl. latter half of 10th c.). He also formed his own manner of "sketching from life (寫生)," becoming a master of flower painting in the Qing dynasty. 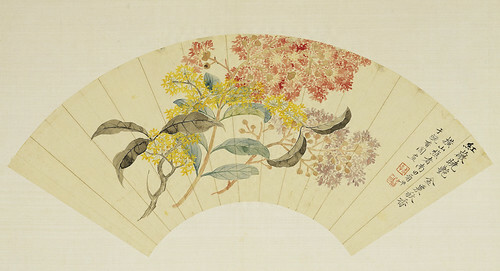 This leaf, from "Album of Qing Flower Paintings (清花卉畫冊)," originally was a folding fan. It depicts clusters of two plants that bloom in late summer and early autumn, during the eighth lunar month: sweet osmanthus (桂花) and crape myrtle (紫薇). The sprays intersect in riotous colors, the complex blossoms overlapping each other. The petals were done mostly with outlined washes, the colors revealing layered gradations. The leaves were rendered in the "boneless" method of washes, the veins turning with clarity. All of these features reveal the wonders of Yun's "sketching from life." The artist's inscription on the painting reads, "Red crape myrtle is colorful at daybreak, golden grains (of osmanthus) fragrant in autumn (紅薇曉豔，金粟秋香)." The two types of blossoms compete in beauty, the fragrance intoxicating. This work was done in Yun Shouping's studio, Ouxiang Pavilion (甌香閣), located on the banks of the Baiyun River (白雲溪) in Changzhou, where Yun lived for many years in his old age. This painting depicts stalks of calamus (菖蒲), lily (百合), and pomegranate (石榴) together. The pomegranate is rendered in cinnabar red for a very archaic yet beautiful color. The calamus is in cyanine blue, while the lily is done in brush and ink to outline the framework of veins, creating a pure and elegant atmosphere. The darkness of the ink here is also quite becoming, the colors bright and beautiful. Both refined and attractive, neither the composition nor the coloring conforms to convention, making this a mature work of Lu Zhi from the old age of 75 (by Chinese reckoning). At the top of the painting is the artist's signature: "Sketched by Lu Zhi, Baoshan, on the Tianzhong Festival (天中節) of the gengwu (庚午) year in the Longqing (隆慶) reign (1570)." Tianzhong is another name for the Duanwu (or Dragon Boat) Festival, indicating that this work was done on that occasion.